Every now and then life just gives you one of those moments. Mine happened this morning. I got my oldest off to his school, doubled back home to pick up the little guys and get them ready and off to school and then it happened. As Jake said goodbye and headed toward his building, I got Cole out, backpacked up and with hands on his walker he started up the “hill” to his building. I have been pulling off, but this morning, with no line behind me I sat in the car and watched. And there he went, limping up the hill with his walker in tow. And the tears started to build. I’m not sure exactly what the moment was all about. It was a mixture of emotions as I can recall. 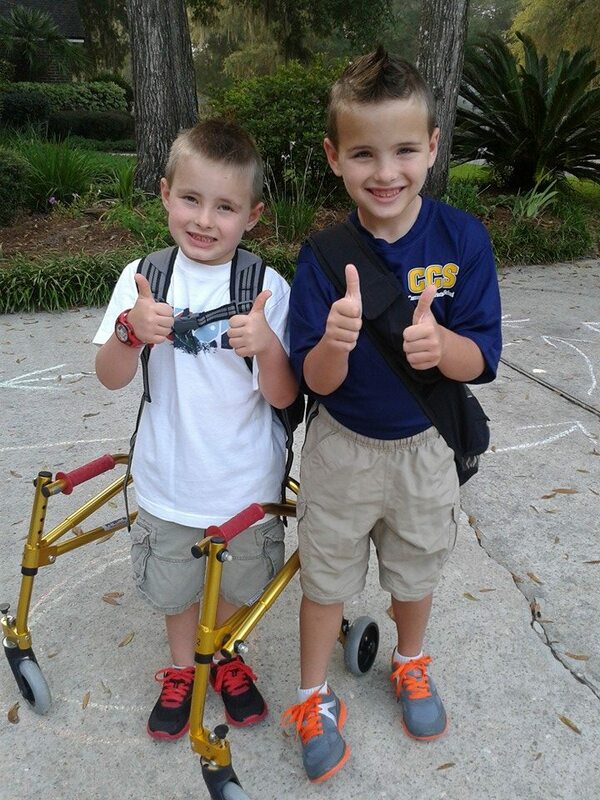 There was some definite “praise God for His healing hand on my son’s life”, mixed with “rejoicing that my son is actually walking and can go to school” with some “realization that there goes my little guy growing up” and some added “doubts of will he ever walk ‘normally’ again and be able to run up the hill like some of his classmates?” It was a hard, yet tender, happy, yet sad moment. It didn’t last long and I did think to try to grab a photo or video but my eyes and heart had trouble taking it all in for that moment. But now that I look back on that moment this morning, I’m really grateful. I’m grateful to be present and able to experience these moments with Cole (even though he had no idea he created a moment for me). And even though I wouldn’t have been able to write about it this morning, I’m grateful to God for allowing me the ability to process moments like this morning. Because inevitably these moments remind me that He is the Master of these moments. He creates them for us knowing what we need even if we don’t know we need them. He gives us the reminder that His thumbprint is evident in the most routine moments of our lives and of course in the special ones. We most certainly see His hand in the beauty and expanse of His creation. Passages like Psalm 19:1 remind us, “The heavens declare the glory of God, and the sky above proclaims his handiwork.” We certainly see and recognize His handiwork in creation all around us. And then is Psalm 8, “When I look at your heavens, the work of your fingers, the moon and the stars, which you have set in place, what is man that you are mindful of him, and the son of man that you care for him?” We see God’s hand from the great to the small. I’m reminded that the One who flung the stars into space is also creating minute moments for me. He is mindful of me so that His moments can make me mindful (and worshipful) of Him. Cole continues to progress well. He loves school and is able to move around pretty well with his walker. He does face some limitations – some in tougher areas like what he’s allowed to do (or not do) on the playground or during PE. He sometimes has to ride in his wheelchair to navigate the longer distances or steeper declines getting around the school campus. He’s scooting around at church and home. From what we can tell, his leg is continuing to get stronger and maintain the flexibility he needs right now. We hope to know more details on the medical side and have new X-rays at his next appointment with his doctor/surgeon in about a month. But until then we celebrate God’s healing hand and continued faithfulness to Cole and our family. And we continue to be thankful for the “one of those moments” as He gives them to us. Some are harder than others, but all continue to remind us of a God in heaven who loves us and walks this journey with us. And to those of you that are also walking this journey with us – giving encouragement and support, please know of our deep love and gratitude. God bless you nd your family! Where does Cole go to school? Thank you Todd. I can only imagine that moment that you have described so well. Thank you for your faithful sharing that is such an encouragement to the rest of us who are writing our own (sometimes hard) stories. God bless all of the Velebers.